Nail art is the essence of decent beauty as nails speak volume about you. Traveled through the ancient tales of art and beauty, nail art now has become an ocean of more or less defined sense of self. After reading our ultimate guide on removing acrylic nails many readers mailed us about nail art inspiration for spicing up their nail art projects. As we love our readers, we couldn’t say no and curated a list of acrylic nail designs that we found fascinating. Here is our collection for trendy acrylic nail designs for you. Give your nails a classy lacy look to add a distinct charm to your hands. Start with applying a nail base coat and let it dry for few minutes. In the meantime, mix the acrylic paint of your choice with water in a bowl. Wrap your nail with the lace of any design and airbrush or sponge over it. Now take off the lace and paint the nail with the transparent nail to add a protective layer. Clean your skin and you for further enrichment you can also add any cute accessory. Ombre Waves nail art to spice up the colors of your heart in a refreshing way. Firstly, apply a base coat and let it dry. Now make the stripes of white and blue nail paint on the sponge. Now sponge the polish on your nails. For adding short and detailed strokes, paint it detail brush and blanc tool. Let it dry and then top it with top coat or gel setter for final finishing. For adding more fineness to your nails, firstly, hydrate them with some good oil. Now, apply the base coat and then paint them with your any favorite color. 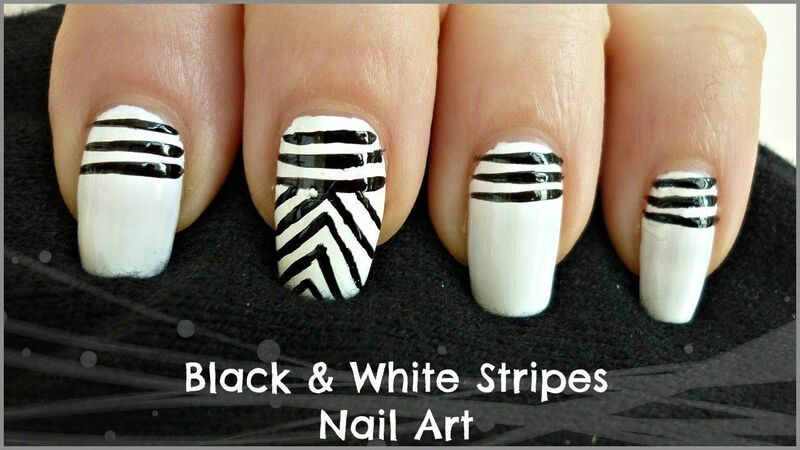 With the help of blanc, crease slightly tilted stripes vertically or horizontally across the nails. Use a liner brush to make detailed outlines. Let it dry and finally, coat with gel setter. 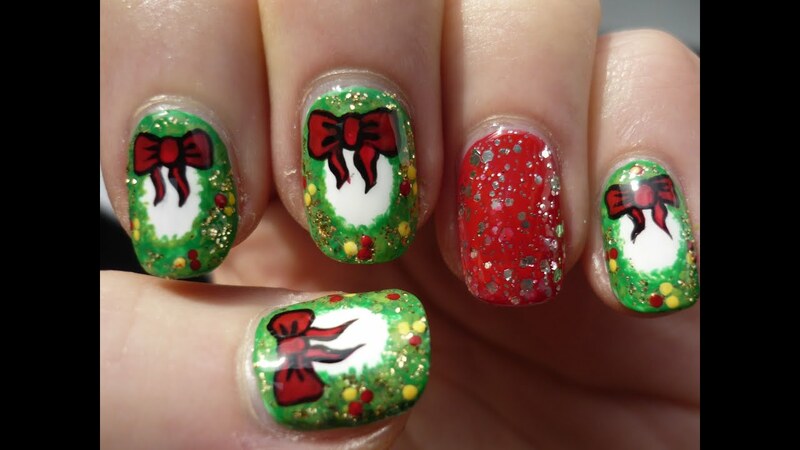 Spruce up the zest of Christmas festive season with this holy wreath nail art. Begin with a thin layer of base coat. Then apply two thick layers of green nail paint. Now stick holy green leaves on it and with the help of thin nail brush put some red and yellow dots on the nails. Let it dry and paint the sparkle nail polish over it. Add some edge to your next party look with this unique stripes nail art. Hydrate your nails with any good oil and then apply the base coat. Clean your nails and apply the base coat. Now, paint the nail with any nail paint and apply thin diagonal stripes above it. Let it dry and then seal it with top coat. Uniform nail art for adding the simple and elegant look to your style. Apply a thin layer of first transparent base coat and then apply two coats of any color. Let it dry and then make thin stripes down the side. Now, similarly make two stripes horizontally across the nail. With the help of a striping brush, outlines the lines with thin lines. Finally, seal with gel setter top coat. Feel the depth of winter with this elegant snowflakes nail art. Step1) Apply the base coat, let it dry and then paint your nails with white colour. You can also go for the transparent base instead of white. Step2) Now, draw three or four lines on your nail to make the foundation of the snowflake. Step 3)For designing the ends of the snowflakes, just make little Vs at the end of lines. Step 4) To complete the snowflake, make hexagon connecting the intersecting lines. Step 5) Add little dots in between and paint it with sparkle paint. Finally, seal it with top coat. Carry the true spirit of Christmas for standing out the holiday brunch. Begin with top coat and apply two thick layers of red nail paint. Now make freehand art designs of the sweater with the help of stripping tape and dotting tool. Seal and shine with top coat. Christmas light nails for adding a dazzling and unique appeal to the festive look. Paint two coats of silver color nail polish. Then using a striper brush, make the wavy string of black color to give the wire look. Dab the dots of nail glue on the areas of crystals. You can use crystals of any shape round or leaf shape. Stick the crystals on nails quickly and let them stick properly. 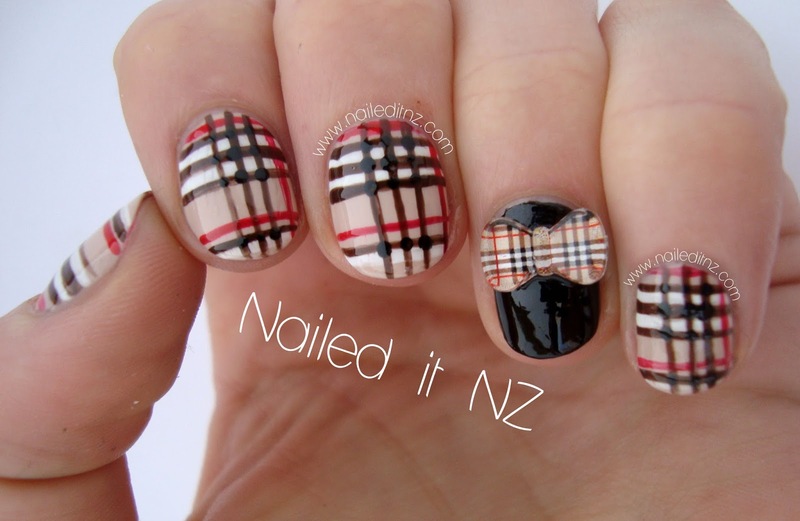 Embrace the simplicity of plaids with this classy plaids nail art. Apply the base coat, let it dry and then polish the nails with red nail paint. Now, use the striper brush to draw four boxes on each nail. Then, Create vertical lines with these boxes to create the plaids effect. Fill the boxes with black color and seal the nails with top coat. That’s about it guys. We are curating more of these stunning acrylic nail designs for you to look even more beautiful and impress everyone around you.